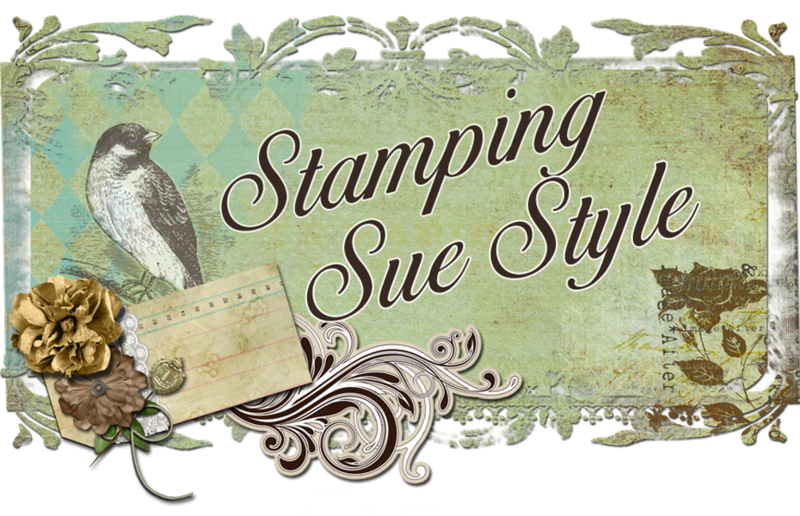 Stamping Sue Style: Happy Birthday ! I found some time to make a birthday card, though it did take me several days, and below is the reason why ! 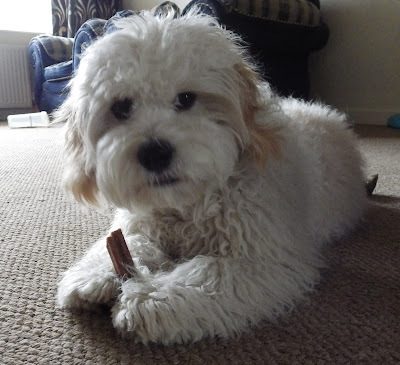 This little fella certainly takes after me as he loves paper, the only problem is he likes to run off with it ! So finding time to craft is a definite art and everything has to be above waist height otherwise it's fair game ! 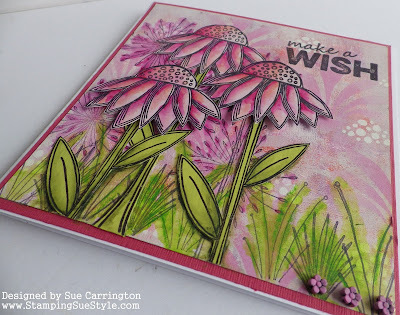 So back to the birthday card, I'd got some of the new PaperArtsy stamps and they'd been staring at me for a couple of weeks so I took the opportunity to open them up and have a play. The background was brayered and I used some of the new Fresco Finish colours. 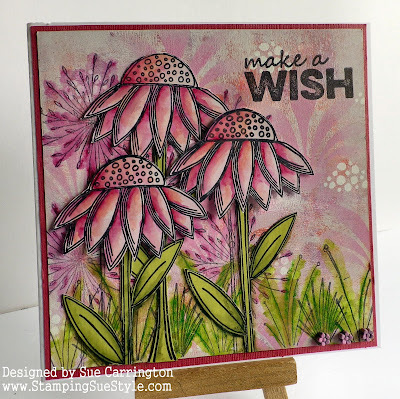 I then did some stencilling using one of Lin Brown's new stencils. I stamped the background using one of the new Kay Carley stamps. I used my Inktense pencils to add some colour and did the same with the grasses. 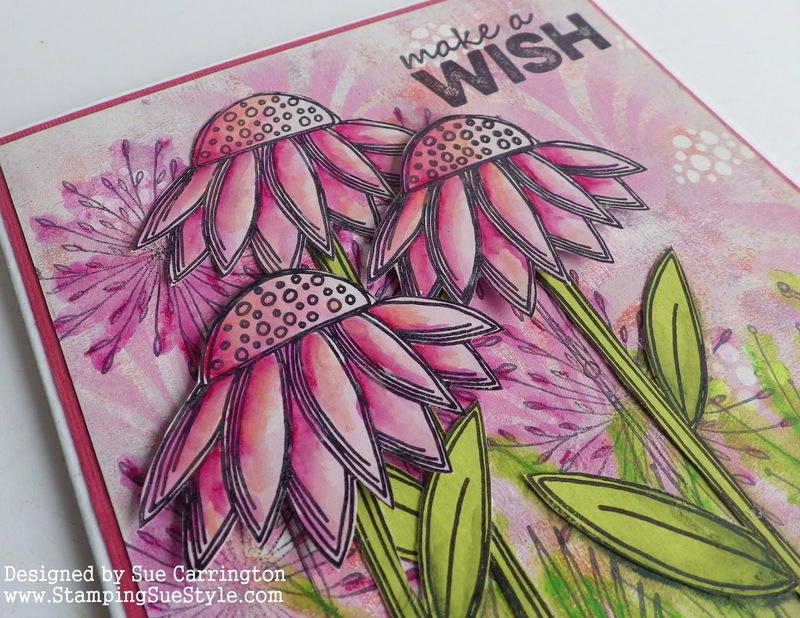 The flower heads were stamped onto painted Smoothy card then I used my Inktense pencils again to add some colour. Rather enjoying using my Inktense pencils at the moment ! The flower heads and stems were then cut out and glued into place, the flower heads raised up on foam pads. To finish off I used one of the new Lin Brown sentiments and added three little flower embellishments that I painted with Fresco Finish paints. So it just leaves me to say Happy Birthday Ruth ! I hope you've had a fabulous day ! OMG, he is adorable. The card is no slouch either. Love the stamps and the bright pink colour. Aw, I didn't know it was Ruth's birthday but what a stunning card you created for her Sue. 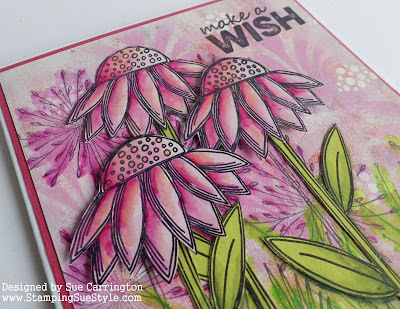 Absolutely wonderful in every respect The gorgeous daisy is the next of Lin's new stamps on my wish list. I've hardly ever used my Inktense pencils which I've had for years but you've really prodded me to get them out with your beautiful work here. Love your cute little furball! He looks a real bundle of mischief, lol! Fabulous card, I'm "needing" some of the new paperartsy stamps but I'm just so taken with your little dog, he is the image of my daughters Cavashon puppy ! A gorgeous card - and an adorable excuse for taking time off from the craft table! Wonderful background for your beautifully colored and layered blooms Sue! and your little paper eater is adorable! Ahhh - your baby is adorable Sue - thank you for sharing his handsome picture!!! Can't blame him for wanting the paper when it's so gorgeous!!! This is a lovely card - the colors are just stunning. 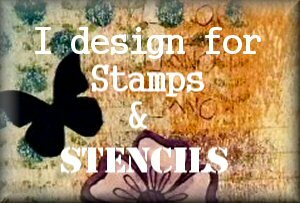 Super fine stencils/stamps. XXj. We're going green at Frilly and Funkie ! A home for Tim !